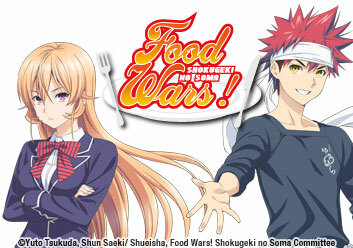 Soma spends his days battling his father to see who is the best chef at his family restaurant. Things get complicated when a developer tries to muscle in on their land. Soma goes up against a difficult foe: Erina Nakiri, owner of the "God's Tongue": her palate can literally make or break your career! Can a lowly diner chef pass her test? Soma causes quite a stir at the opening ceremony, declaring his intentions to be #1. His first big obstacle: a world renowned french chef and an overly nervous teammate! Soma arrives at Polar Star Dormitory with high expectations, but its shabby exterior houses talented chefs, an incredible kitchen and an unexpected challenge! Another challenge is underway! Though, it’s not official, and Soma soon discovers that an official challenge is something entirely different - it’s a Shokugeki. Soma is drawn to Donmono Research Society, only to find that it’s being threatened by Erina’s lackey, Mito Ikumi, nicknamed the Meat Master. The Shokugeki between Mito Ikumi and Yukihira Soma has begun! Soma will have to truly transform his cheap ingredients to combat the Meat Master’s expensive beef. A brutal training camp is underway. Those in Polar Star Dorm are determined to survive, but Soma may have met his match - another professional! Soma’s fired up by Takumi Aldini’s challenge and skills. With only the immediate vicinity as their pantry, Soma finds the perfect ingredient to set his dish apart. Under the alumnus Shinomiya, Soma and Megumi are given a complex “recette” that they must follow to the letter. But Shinomiya is a cruel judge, and more severe than expected. Soma’s reckless streak flared up again and it’s landed him and Megumi in hot water. Their opponent is no student this time, but a magician! It's Megumi's chance to show off her skills. This time, Soma's taking the supporting role and her cooking will have to save the day! The training camp lives up to its brutal reputation as the exhausted students are given two choices at the end of day three! Soma's dish is literally deflating! It will take every ounce of his focus to get back on track, but it might be too late. As the members of Polar Star Dormitory finally make it home, they’re treated to a meal from a surprise guest, whose fame rattles even Soma. Soma has his first showdown with his dad in months. With Isshiki, Tadakoro, and Fumio judging this morning match, will this finally be Soma’s first victory? Soma and his team work on a tasty, original and portable dish to combat the Mozuya invasion. They’ll have to make their mark on the Sumire shopping district or watch it fall. The lists for the Autumn Elections are out! When the topic is announced, Soma seeks out a former colleague of his father’s and finds more than he bargained for. There’s no summer break for the Autumn Election participants! Soma and the others work to enhance their dishes over the six weeks before they head into the prelims. The Autumn Election preliminaries are underway! Megumi shocks everyone with a tricky ingredient, and the election hall is assaulted by “cursed”curry! The prelims continue! Hoshino’s curry is judged, and the Aldini brothers face off. In the wake of Alice Nakiri’s dish, the judges make the mistake of almost forgetting Megumi. With the finalists from Group B solidified, Group A is reeling as a judge continues to give zero points. Ryo Kurokiba, Alice’s aide, presents a dish that surprises everyone. Soma faces off against Akira Hayama as both dishes are presented. The tension reaches incredible levels as the finalists are chosen!